Protective Epigenetic Marks Go Awry in Alzheimer's Disease | What is Epigenetics? Alzheimer’s disease (AD) is a complex neurodegenerative disease that occurs due to an accumulation of amyloid plaques and neurofibrillary tangles in the brain. It affects over 5 million Americans of all ages, particularly those over 65 years of age and is one of the leading causes of death in the US. Currently, there are no sure ways to cure, prevent or even slow down progression of the disease. It is believed to be caused by a combination of genetic and environmental factors, but the strongest known risk for AD is age. How molecular age determines a person’s susceptibility to develop AD is still in question, but epigenetics – in particular, histone modification – may help shed light on steps and treatments towards preventing the disease. Scientists from the Perelman School of Medicine at the University of Pennsylvania wanted to dig deeper into what happens in the brain, particularly the lateral temporal lobe of a person with AD. The degradation of this region has been linked to early development of the disease. First author and postdoctoral fellow Raffaella Nativio, PhD and her colleagues mapped out the epigenomic landscape of AD brains and compared them to the healthy brains of both young and elderly donors. “Our results establish the basis for an epigenetic link between aging and Alzheimer’s disease,” said Dr. Shelley Berger, professor of Cell and Developmental Biology at UPenn and co-senior author of the study. She is also the director of the Penn Epigenetics Institute. 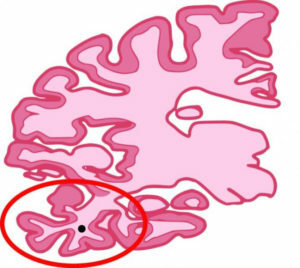 Researchers looked at the lateral temporal lobe (red circle) of human brains in this study. Credit: Shelley Berger Lab at University of Pennsylvania. Shelley Berger’s Lab focuses on mechanisms that regulate gene expression with a special emphasis on how the DNA-packaging structure of chromatin is manipulated during genomic processes. In their study published in Nature Neuroscience, Nativio and her colleagues focused on the link between an epigenetic mechanism called H4K16ac (acetylation of lysine 16 on histone H4) and the development of AD. Epigenetic marks have been previously linked to memory – its decline a hallmark of AD – in numerous studies. For example, DNA methylation levels were shown to be connected to the development of memory disorders in honeybees. Other research suggests that poor sleep and histone modifications might degrade memory and RNA methylation gives clues to strengthening memory. The H4K16ac mark is known to control higher order chromatin structure and nucleosome level interactions as well as regulate DNA damage and cellular stress response. It has been previously demonstrated that an increased presence of this particular histone modification could have potential to treat lung cancer. As the brain ages normally, the amount of H4K16ac found on the genome increases to ensure the control of DNA damage and repair and helps to maintain healthy brain function. The group of researchers found a great decrease in the presence of the epigenetic marks in brains with AD. Particularly, the loss of this epigenetic mark occurred near genes related to aging and Alzheimer’s. These findings suggests that healthy brains take epigenetic precautions to prevent AD, but when these protective epigenetic marks become dysregulated, a person could become more susceptible to developing the disease. Alzheimer’s is characterized by an accumulation of plaques and brain cell tangles, but this usually doesn’t occur until the disease has matured, leaving little room for treatment. The researchers identified a link between the genomic location of the changes to H4K16ac and the genetic changes associated with the development of Alzheimer’s determined in previous studies, indicating that certain epigenetic regions could be targets for drugs aimed at preventing the progression AD early on. Although this study does not pinpoint a cure, it is certainly a crucial step in the right direction to uncovering a way to prevent nerve cell death associated with the disease. Berger and her colleagues plan on conducting future experiments focused on discovering the changes that cause a decrease in the presence of H4K16ac in AD brains. They hope to be able to enhance the quality of aging to help maximize the epigenetic precautions taken by the brain to prevent people from developing this devastating disease. Source: Nativio, R. et al. (2018). Dysregulation of the epigenetic landscape of normal aging in Alzheimer’s disease Nature Medicine, 21, 497–505. Reference: University of Pennsylvania. Penn Study Shows that the “Epigenetic Landscape” is Protective in Normal Aging, Impaired in Alzheimer’s Disease. Penn Medicine News. 05 Mar 2018. Web.